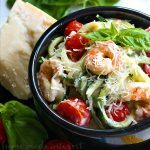 This easy one pot meal is a combination of shrimp, fresh tomatoes, zucchini noodles, and creamy alfredo sauce. Note: If you want to use fresh , uncooked shrimp you can. Just saute the shrimp with the garlic for 2-3 minutes or until it becomes pink then proceed with the recipe as written. In a skillet over medium high heat add diced garlic and saute for 30 seconds. Add shrimp, zucchini, tomatoes, fresh basil, and Bertolli® Creamy Basil Alfredo Sauce. Cook for 5-7 minutes or until warmed through.